There are exciting international changes brewing this year because of two elderly men who are shaking the foundations of religion and government. 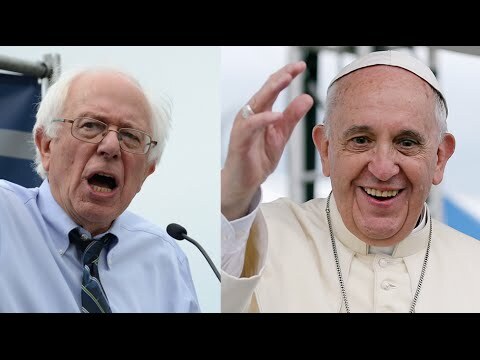 It appears that Vermont Senator Bernie Sanders, 73, is exciting mass crowds as he stumps for the presidential nomination in U. S. 2016 elections, and Pope Francis, 78, is exciting followers in his call for world-wide social revolt. News columnists are beginning to notice the phenomenon. They are dubbing what is happening as a social revolt against the failing American capitalistic system that is utilizing an ill-gained wealth to control governments and consequently enslave the masses. While Pope Francis denies that he is advocating socialism, Bolivian President Evo Morales said the Pope’s emphasis on creating a world in which no one is excluded amounts to socialism. “He’s talking about community, about living in harmony,” Morales said. Like Pope Francis, Sanders is battling against income and wealth inequality, he wants to get big money out of politics and is refusing to accept corporate financial gifts to finance his campaign. He is calling for better paying jobs, racial and women’s rights, a fair immigration policy, a reformation of the way Wall Street does its business, a restoration of the nation’s failing infrastructure, and best of all, he wants to save the environment and fight climate change. You may call the Sanders platform “socialism,” and you may be confused by the political attacks that will be battering his platform from big money interest groups, but when you get down to it, his popularity is based on one simple fact. Sanders is calling for what most Americans really want and what big corporate interests (represented by most elected representatives from both Republican and Democratic Parties) are consistently voting against. Sanders may be getting some solid support this week from the Pope when he appears before the United Nations General Assembly. He is expected to challenge America’s capitalistic profits-centered position and especially challenge the world’s failure to do something about climate change. A report in Time Magazine by Christopher Hale outlines a five-point assault against the world’s overpowering capitalistic system that will probably be brought before the UN. He will stress that (1.) everyone has a sacred right to land, lodging and a job; (2.) humanity must be at the center of global economics, not corporate profits; (3.) the world is running out of time and there must be action now to deal with climate change; (4.) real change must come from the grass roots because politicians rarely lead; and (5.) socialism is now a moral obligation because the world’s remaining resources must be protected and shared by all. The Pope reminds us that Jesus told the rich to provide for the poor. For Christians this is a commandment.